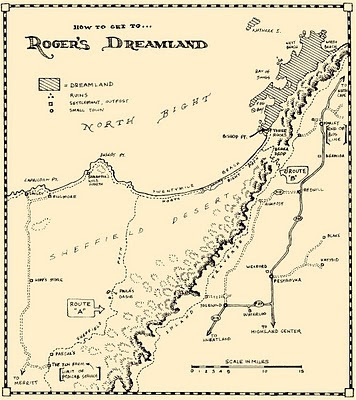 No one has yet captured an image of The Dreamland itself! Some can find the Dreamland, some cannot. 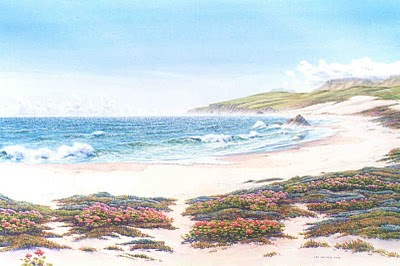 The point of entry is at the north end of Twentymile Beach, a place called Three Rocks. in other words a kind of Eden instead of the crashing surf you hear below. image in your mind, and there you are. When he could be located, Roger Putney became the island's spirtual leader. During those first years when everyone feared a takeover by the British navy or other major power, Roger spoke of sharing, forgiveness, working together and being extremely creative about living together, given the high offset of women to men. The terms Family, Village, Town and Settlement took an new meanings, mostly through Roger's teachings. When Roger wasn't wandering the island and talking to people, he found time to marry Louise Atherton, a long-time friend. They built a stone house in Monaghan, and as their three children grew older, he once again set off walking the hinterlands of the island, often taking a kid or two along. They stopped along the way to build tiny hermitages or single-room huts, usually of stone, in isolated places, as retreats for other wanderers. His oddest contribution came late in life, and many people wonder why it exists at all. When Roger was about 70, he wandered off alone for over two years having left no word except secretly to Louise. People began to worry and many searched for him but found no trace. Then, on a bright chilly June morning in 1872, he walked into the Monaghan Commons appearing "healthy, rested and not a day over 60! ", according to the Monaghan Bugle-Tattler. Ya look for the three rocks at th' end o' that long beach up north, then ya stand on th' middle-one of them an, look out ta sea fer a while an' let yer mind rest. Be with what yer see there and think what ya'd like to see. If ya believes as if ya know it's there, it'll be there. Yaa-hh, that Otter told me....Ha! " Roger stayed near home after his long absence, sitting in on local council meetings as 'spiritual advisor'. He also ran a kind of personal counseling service to help pay the bills. He was sorely missed when he died in 1891, at age 92.
as laws to be obeyed or else. Yet people listened. Not unlike Moses on his way down from Mt. Sinai, Roger came away from the otter with new ideas that were actually very old ideas! Roger spent his lifetime sharing these ideas, mostly by example. At first he just spent his time around Monaghan, reading what books he could find, and wandering around in the nearby hills, along the river, or out on the beaches. Then the people of Monaghan heard of another new town to the west, New London (now Putney) whose residents were close to starvation. In 1816 the Atherton Dove was driven aground by yet another storm, this time onto the beach near Alison, about 80 miles east of Beastey Bay and on the South Bight. New Island was still uncharted territory and was increasingly becoming a shipping hazard: the islanders would not build lighthouses in fear of a discovery and takeover by the British or other nation. Infuriated , Denby convinced most of his entourage to follow him overland far away from this "rabble of convicts" and build their own colony. He too had heard of good land to the north but insisted on locating near a deepwater harbor. He eventually found it at present-day Putney Bay. His group of about 160 men and women were the first to settle the region, and they eventually found that the soil was sandy and the local water too brackish for successful farming. Denby insisted on settling here anyway, and declared himself Colonial Lord Governor of the entire island, arguing that convicts and even the venerable Capt. Hayes, had no legal claim. To enhance his authority, he hired (or coerced) many of his followers to build a proper manor on a hilltop west of present-day Putney. Staple crops weren't planted in time and then the weak soil hampered any harvest. His followers, who had come this far with him, finally became dissillusioned when the food became scarce, and by April of 1817, the settlerment of New London was becoming desperate. Then Roger appeared, wirth several women from Monaghan pulling a small wagon. This was loaded with morsels made of ground oats, wild nut butter and honey they called 'stickyballs'! 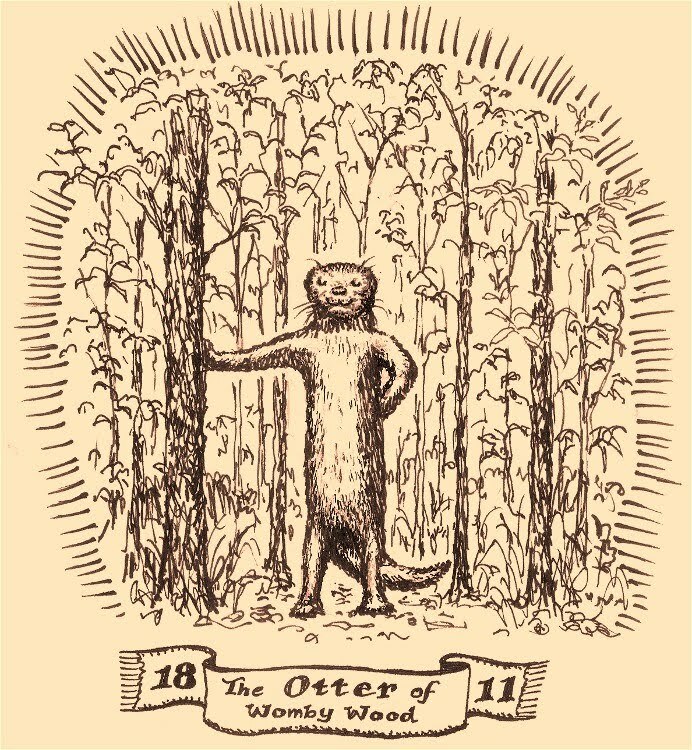 Roger simply said, "We brut these fer yer 'unger...we're a grain food tribe." and the grateful New Londoners swarmed the wagon. Later Roger and the women taught the settlers how to cast for perch in the surf, and how to find holyoke clams in the bay. He then offered to trade their inland bounty for fish and clams from the coast---which soon allowed New Londoners a level of independence form Mr. Denby. They abandoned Denby's projects and more or less ignored him as he eventually isolated himself within his half-built mansion. This was one of many 'Roger events' that helped convince new Islanders that they might just thrive here, on their own, and create entirely new ways of living together. Roger, to his chagrin, became the spiritual leader of this emerging nation, especially after his strangest discovery yet to come. 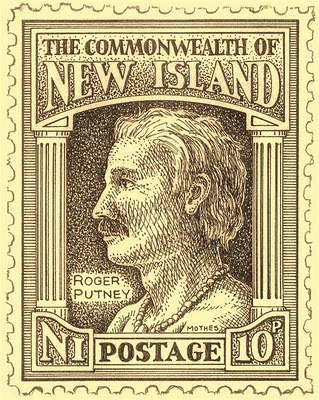 Roger Putney on New Island's first 10-penny postal stamp. Roger Putney was the first European born on New Island. He arrived on Nov. 6, 1799, only one month after the wreck of the Lady Marie. Roger never knew his father but was close to his mother, Tabathea, who taught him to read by age six. Before long, Roger was allowed to visit Capt. Hayes' private library, which much later became the island's first lending library. With a book or two and lunch in a sack, young Roger was often seen wandering off in the early morning toward the beaches and hills, and not returning until dusk. Cecelia O'Hassett, a friend of Tabathea's, was very impressed by this boy who seemed very insightful for his age. Roger in turn was awed by Cecelia's charisma, and loved to sit with her and listen to her naked-protest stories! From Cecelia, Roger learned not only diplomacy, but that rare skill of really hearing both sides' arguments and then finding the elegant solution. When Roger was about 15, people began to notice his intense gaze, soothing touch and an aura about him that could put you to sleep. They felt they could trust him completely. His reputation as a shaman or guide spread among the newly settled communities along the Beastey Bay shore; if you had a problem, Roger could probably help. Scouting and survey parties had been exploring the island almost from the first day they arrived. A valley that had been described as "lush, green, storm-protected" had been located to the north, so in 1813 Roger and Tabathea joined a small settler group who trekked there and founded the town of Monaghan. 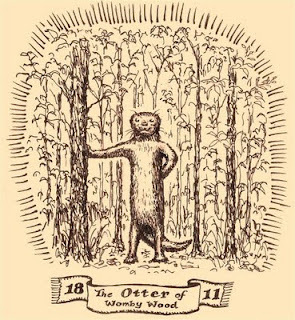 During a wedding celebration the next year the mysterious otter appeared, again in a eucalyptus grove, and spoke to several of the participants who were taking the short walk from the wedding ceremony to the feast site. Like the first appearance in Womby, no one said anything in return, for fear they were hallucinating! Check out the Iceberg Article in the Putney Times! Our beautiful island is being threatened by an iceberg 140 square km (54 square miles) in area! Click on The Putney Times, our nation's newspaper, at right, to read all about it. that appeared in Womby Wood in 1811. How can an otter talk much less preach forgiveness?